The Larson Electronics HALP-48-1L-LED Hazardous Area LED Light Fixture is U.S./Canada UL Listed Class 1 Division 2 Groups A, B, C and D - UL 1598A listed, has a T4A temperatue rating and is specifically designed to handle the rigors of wet and corrosive marine environments. 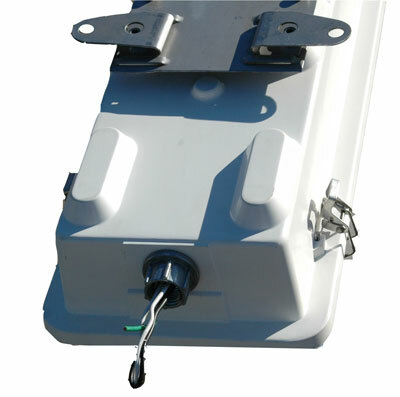 The HALP-48-1L-LED hazardous area LED light fixture is designed for use in wet areas and saltwater-marine environments where corrosion resistance is critical to equipment longevity and safety. This Class 1 Division 2 rated fixture is constructed of non-corrosive materials including a polyester housing reinforced with glass fiber, a poured in gasket for reliable sealing and an impact resistant acrylic diffuser. Corrosion resistant stainless steel latches secure the lamp cover to the housing and provide a firm lock against the poured in seal to prevent drips and water intrusion. This fixture is UL 844 rated and Class 1 Division II, Groups A, B, C, D approved. 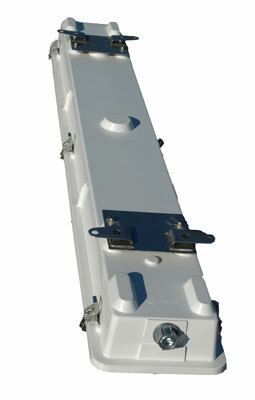 The HALP-48-1L-LED also carries a UL 1598A outdoor marine rating and meets US Coast Guard specifications. This lamp offers the extreme durability, high efficiency and long lamp life of high power LEDs in a proven hazardous location fixture design. The HALP-48-1L-LED is equipped with our specially designed LED T-series bulbs which produce nearly 15% more foot candles of illumination at 8 feet as compared to standard T5 lamps when measured with an Extech light meter. The 24 watt LED lamps produce more illumination than standard T5 bulbs, but draw only 1/3rd of current. The HALP-48-2L-LED is multi-voltage (not multi-tap) and works on the following voltages: 120 Volt 60 HZ, 220 Volt 50 HZ, 240 Volt 60 HZ, 277 Volts 60 HZ. This fixture is ideal for open air hazardous locations where flammable chemical/petrochemical vapors may be occassionally encountered. Suggested Applications: The HALP-48-1L-LED is designed for marine, wet, damp locations where corrosion resistant fluorescent lights are required. This includes petrochemical facilities, lubrication pits, oil drilling rigs, crew quarters, solvent/cleaning areas, water treatment areas, processing plants and marine loading docks.